Outdoors Stupid from around the World takes the reader on adventures throughout the world with a whole new cast of characters who continue the tradition of questionable judgment and bad luck. In Alaska, the main factors that can kill you include environmental hazards such as weather, terrain, and cold water; from critters, the main danger comes from bears. 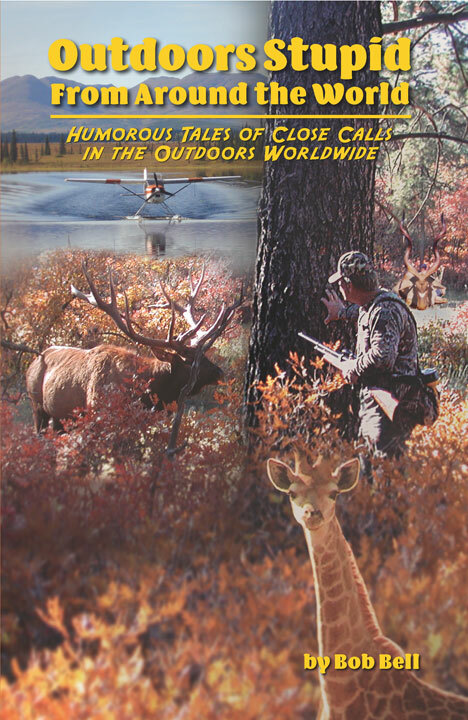 Outdoors Stupid from around the World is Bob Bell's third book. The first two, about the Alaskan adventures of Bob and his band of I.Q.-challenged friends, are titled Oh No! We're Gonna Die and Oh No! We're Gonna Die Too. The first book is mostly Bob's misadventures and the second is about his friends' attempts to get themselves killed in the Alaskan wilderness. During his travels around the world hunting and fishing, Bob met many guides, outfitters, professional hunters and their clients. They related several stories to him, many of which are included in Bob’s new book. These stories show that the love of the outdoors exists everywhere you go and that I.Q.-challenged decisions are an international curse. This book, like his others, is also written in a humorous fashion that conveys the apprehension, excitement, and relief involved in life-threatening adventures. On an international level, Bob and crew encounter pumas, hogs, lions, hippos, buffaloes, leopards, elephants, snakes and many more well-oiled killing machines. Buffalo charges, lion attacks, moose assaults, puma/pig/dog fights, and a surly bull elk are everyday occurrences to this hapless lot. Then there are environmental issues but on a grander scale than those found in Alaska. All in all, the range of options to get yourself killed on an international stage is greatly expanded. These stories give insight into the excitement and pitfalls of high-risk adventures in the great outdoors. Add to this a lack of intelligence, clear thinking, or panic, and you’ve definitely got a recipe for excitement. Enjoy your trip with us through our misadventures from around the world. Submit your review for "Outdoor Stupid from around the World (Sc) "